Arrgh me maties, that illicit trade! This is a very quick post from Oslo City Hall, where I'm attending the Signing Ceremony of the new Convention on Cluster Munitions (CCM), a ground-breaking humanitarian disarmament treaty agreed in negotiations in Dublin at the end of May. The Norwegians have played a major role - both as instigators of the so-called Oslo Process, and as members of the core group - and so it's very fitting that Norway host the signing. And, although a cold day outside, there is a very warm atmosphere in the meeting hall. The ceremony was opened by Prime Minister Jens Stoltenberg and high level speeches followed from Foreign Minister Jonas Gahr-Store, International Committee of the Red Cross President Jakob Kellenberger, the United Nations and several Ministers of various governments including two key cluster munition affected states, Laos and Lebanon, set an upbeat tone. Two of the most powerful statements were from the Cluster Munition Coalition (CMC), the civil society consortium that has worked in partnership with governments, the UN and ICRC to achieve the CCM. 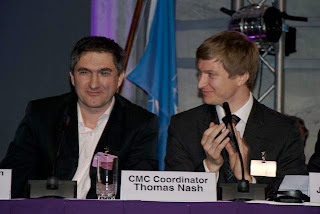 CMC coordinator Thomas Nash and spokesperson and Ban Advocate and cluster munition survivor Branislav Kapetanovic (pictured) each spoke movingly of the campaign's journey from voice in the wilderness to treaty, and Branislav also related some of his own experiences and the challenges of living as a survivor. Signing of the treaty has already begun as I write this, and Ireland, Norway, Sierra Leone and the Holy See have indicated that they are also in a position to ratify the treaty straight away. It's unclear yet how many countries will sign the CCM in Oslo, but it should be at least in the high 80s. It's not inconceivable that the symbolic number of 100 is reached, but since very specific requirements have to be met in terms of letters of legal powers for delegations to be allowed to sign, there will be inevitable hiccups that might prevent that. We'll see, but it's great to be here to see after such a huge amount of effort over recent years. Picture of Branislav Kapetanovic and Thomas Nash (CMC) by John Borrie.